I am so addicted to this show and I only just heard about it. A friend of mine was hosting a Masterpiece classic Downton Abbey premier party and invited me. I almost never watch TV so of course I had never heard of it. I looked it up on netflix Friday and watched all of season 1 that night. Then, of course, I was freaking out because I couldn’t find season 2 other than on iTunes for $3 an episode. Sorry, but if I’m going to pay that much I’d want a DVD. There are 9 episodes in season 2. I might just get the DVD’s later because this is a show I will most likely want to watch again. Once you get started on this family you wont be able to quit watching. Well, a friend told me last nigh that you can watch it on Amazon Prime for free. My son has Amazon Prime on his new Kindle so I used that to watch season 2. I was up all night since I couldn’t resist hitting “next episode” to find out what happened next. Both season’s 1 & 2 are available on Amazon Prime and they have the original uncut version. It really is such a great show. I love learning about different time periods and how different things where then. During the show they get electric lights put in and then a telephone although not everyone was ready for the changes. My favorite character is Lady Sybil Crawley. She is so genuine and I really admire her strength of character and caring spirit. She pushes her parents to allow her to take a nursing class so she can help in the hospitals with the care of the wounded soldiers. She falls in love with someone her parents don’t approve up but she wont be moved. Things were so different then and the women’s rights movement was just beginning. Lady Sybil of course was interested in this and wanted to go to the rallies. This show has had me smiling at touching moments, laughing, crying, and hand-over-mouth in shock. Occasionally I had to pause the show because I had to digest some of the emotion I was feeling. Some of the best moments come from the staff. There are some very touching moments between Lady Mary (the eldest daughter) and Carson the butler. He watched her grown from a little girl into a young woman and has a special spot in his heart for her. The viewing party ended up being canceled due to illness but I was resting up from my marathon watching session anyway. I will watch the season 3 premier episode at 2am instead! I started watching this on Netflix last month but never made it past the first episode. I’ll have to give it another try. Rebekah, you have to! I love it. At first I had a hard time understanding the accent but now I think I’m going to start sounding British LOL I would never have survived in that time or as one of the daughters. I’m not very good at following rules and although I love to dress up I also love being dressed way down most of the time. I will have to catch up on Netflix. I haven’t seen it, and my Jane Austen Group all love it. I don’t know what I was watching when it started, but I missed it and then didn’t want to start in the middle. Winnie, you really should. You would love it especially if you are part of a Jane Austen Group! How cool. I watched a special about the real castle on pbs and it was really interesting. 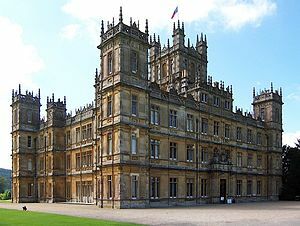 It is called the Secrets of Highclere Castle. You should see if they show that again in your area. It was really interesting.